#iWillLive Stories of Inspiration: Jerald Cobenais – UNITY, Inc.
#iWillLive Stories of Inspiration -Written by UNITY Youth: Jerald Cobenais, Red Lake band of Ojibwe on his experiences with Suicide, and how he overcame. “At an early age I was affected by suicide. I lost my older sister when I was 7-years-old. At the time, I didn’t even know what suicide was. I was raised Catholic and attended a catholic school here on my reservation for six years until attending public school. Growing up I was taught to never to fight against bullies or be mean to other people. As a family we sought out resources such as counseling for a short time after the tragic loss of my sister Brittany. Brittany was 16-years-old when she died. When I transferred to public school, I never knew how kids could be so cruel and mean to each other. I faced another struggle in seventh grade, after being diagnosed with ADHD, I was teased daily by the other students. I was beaten and humiliated. I remember the date was October 2nd when I experienced another suicide. This time it was my best friend Simon. I had gotten the call from my friend Chase I had grown up with Simon. We were together since the first grade, until he moved away to a boarding school. I was shocked to find out he died by suicide because he was known as someone who was genuinely happy and nice person. I remember he would always have my back when someone tried to bully me. Simon was a grass dancer, who loved making people laugh, enjoyed music and the outdoors. He loved learning traditional ways of my people. Once again, I sought out therapy with my school counselors to cope with his death. Simon was 12-years-old when he died and was the youngest person on my reservation to die from suicide. Going into 8th grade things weren’t so bad. The bullying had stopped for a short while and I was able to continue onward with school. I was determined to start fresh and fix my grades. But then…. the bullying started again. This time was much worse. I was shoved into a brick wall on my way to class. I remember the bell rang and I realized the tip of my ear was hanging off by a piece of skin. I suffered from a severe concussion. I remember as I walked to the nurse’s office, there were drops of blood falling down on my sweater. I thought it was just a small cut and needed a bandage. I looked behind me at a group of girls in shock, and I wondered what was wrong. The school nurse told them to leave and rushed me to the hospital. It took thirteen stitches to reattach my ear. I stayed home from school for three weeks to recover. Unfortunately, when I came back to school, the bullying continued. I was grabbed by two bullies and shoved head first into a waste basket filled with discarded food. When the teacher returned, he quickly sent them to detention along with my two cousins who had watched the whole thing happen without saying anything. With the help of the teachers and my counselor, the bullying nearly stopped. It’s so important to seek out help when things like this happen at school. On my best friend Chase’s 17th birthday, I was disappointed that my parents couldn’t take me to his birthday party because of bad weather. When I saw him a week later, I asked Chase if he wanted to hangout after school. He said he had plans with other friends. That same day, on the bus ride home I was punched in the groin by another bully. I cried and made sure to tell my family what happened when I got home, because it is important to let your family know what you are going through. My sister Amanda said she would reach out to her friends to talk to the bully. Later that night, my dad received a call stating that someone was shot down by the old bridge. At first, I didn’t think anything of it, my family told me that I could stay home from school, so I was excited to avoid the bullies and could play a new game I had bought with my own money through a job serving lunch. When I woke early the next day, my parents told me that Chase had passed away due to suicide. I finally broke down and cried. I remember feeling shocked, scared and a gut wrenching feeling in my stomach. My family held me and comforted me through the pain. Suicide had taken another person that I loved. The following weeks were horrible. The bullies did not take pity on me for losing my best friend. Chase was the one who watched my back and made sure no one messed with me. I returned to my tools of counseling, and was grateful for the teachers kept a close eye on me. I was scheduled to go to therapy three time a week. I told them I was depressed and had thoughts of suicide. It’s important to tell people when you have these thoughts. 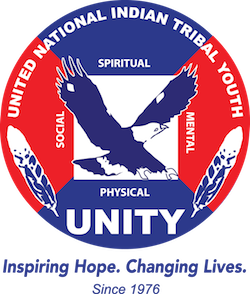 At the 2018 Minnesota Tribal Youth Gathering in Minneapolis, Minnesota, Jerald was selected and served as the co-emcee for the youth gathering of Minnesota Native youth with UNITY youth leader Athena Cloud, both of the Red Lake Nation. Through the strength of my family and time, things began to change. I began to heal and forgive those who teased and beat me. I realized that we were just kids who lacked guidance. I started to understand I was Strong for not giving them the reaction they wanted and ignored them because what they did would not matter coming into adulthood after leaving school. I would like to thank the teachers, counselors, mentors, and most importantly My Family. They helped to build me up, during my tough times. I keep the ones I lost to suicide close to my heart and live each day to the best I can. I strive to help others who feel life would be better without them here. I work to be an advocate for those who went through what I did. The actions of others no longer have such a powerful impact on my wellness. My mindset has changed now, and the thought of leaving my family is a much bigger fear than anything else. Although we are not perfect I couldn’t be more blessed to have them by my side on my healing journey. If you or someone you know are having thoughts of suicide, there are people who can help.